Dream, Create, Inspire: Back Among the Living! I'm back and feeling much better than I was a week ago. I think I am at the end of this New Year yukkiness and glad of it. I hate being sick....it seems like everything I try to do is in v-e-r-y s-l-o-w motion. Thanks to all of you for your well wishes...somehow I think all those kind thoughts helped keep me on the road to recovery. I thought I would share my favorite Christmas gift of all with you. 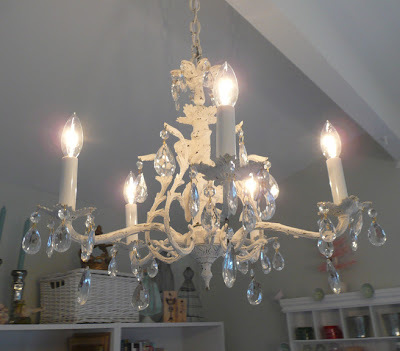 Just look at the picture above. . .yessiree, that is my very own antique chandelier for my studio! It's from my DH and it couldn't have been more perfect! He hit all the marks that I was hinting at all year. . .white, old, hanging crystals. . .it even has a little cherub hanging onto the center post. He made me nervous when he told me one day he was going to Menard's and Home Depot to look for a chandelier for me. I know they have some nice ones there, but not any that fit the look I was after. I think that must have been a diversionary tactic, because in the end, this is the one he bought me and I do love it so! And just like my friend Cerri wrote here about one of her Christmas gifts, I think DH finally gets me! He didn't waste any time getting the chandelier hung, complete with a dimmer switch which is, as you know, essential to getting the proper aura from the light. What a peach he is! 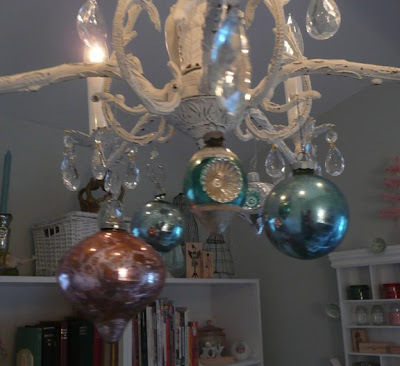 Then after seeing this photo from Holly, I got out a few of my cherished vintage Christmas balls to hang from the bottom. Such a great idea, Holly ~ thanks! Another favorite gift I received was this little ingenious bit of technology. I've been needing a new phone since my contract expired at the beginning of 2008, but procrastinated and kept putting it off due to not wanting to have to learn how to use a new phone. 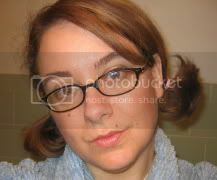 But so far this one is a cinch to use and I like being able to have access to email and the internet (if needed) wherever I am. Finally, I wasn't going to mention this little faux-pas that I had this past week, but then I thought, oh why not! It sort of rivals Karin's little miss-step she wrote about here last year. Because I was bustling around trying to get something out of the messiness of the laundry-room-turned-gift-wrapping-room-during-the-holiday-season, which happens to be a very tiny room and currently has very little floor space to walk on, I had a slight accident. Somehow I turned around and found myself tripping over an empty laundry basket and watching (in a sort of out-of-body-experience kind of way) the whole thing occur in the slowest of motion, but was unable to stop the momentum my body was already in and CRASH! There I was sprawled out on the floor, with my head resting on a bag of discards ready to take to Goodwill and the laundry basket popping off all four of it's plastic handles in the force of the impact! My DH, called out from the other room asking, "What fell," and came to my rescue after I managed to reply, "Not what, but who!" He offered to remove the Goodwill bag from under my head, but I told him I liked the way it was cushioning my head, since I wasn't quite ready to get up and see how much damage I had done to my body. Fortunately I came out of it with only some bumps and bruises and a knot on the side of my head. . .all of which is a lot better than a broken bone in the middle of winter here in the Midwest! A friend of mine told me last week that she believes that the way you bring in the new year sets the tone for the way your year is going to be. Oh dear, I hope she's not right about that, because with the awful head cold and now this fall, I looks like I will be in for one heck of a year! Perhaps my DH should up our insurance just in case! Happy New Year!!! I have been so behind on blog reading during the holidays. I too have had some holiday "yuckiness" going on and am finally feeling better. Glad you are on the mend too! Love that chandelier! Your hubby is too sweet! Hugs!!! Adore the chandelier! Hubby did good! 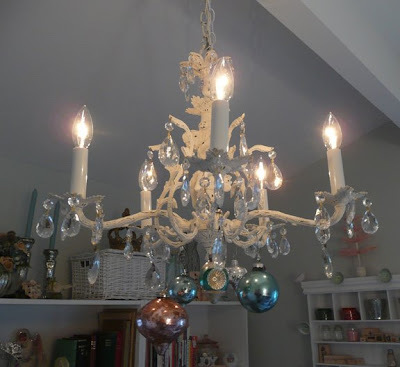 Lovely chandelier! Cool on the phone! Sorry about the fall and hope your cold is about over! Hope you're getting some time in the pretty craft room! Have fun! Hope you are feeling better after that nasty fall. ouch! Love your beautiful gift. Your husband sounds like such a thoughtful and terrific person. Not only to get you the perfect gift, but to also get it installed quickly!! Hi there...Glad your feeling better! I love your chandelier! P.S. Stop by my blog and come celebrate my Blogiversary giveaway! !